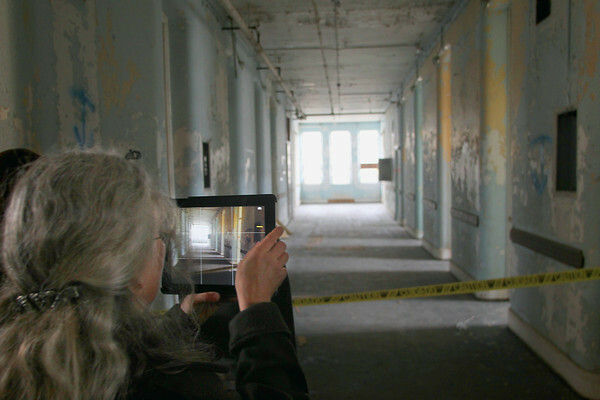 Mary Jackowski (cq) of Traverse City takes a picture of a hallway during a tour of the section of Building 50 that will become senior living. The Minervini Group, Cordia Senior Living and Grand Traverse Senior Living, LLC, held a ground breaking ceremony Wednesday for the Cordia at Grand Traverse Commons, a Senior Residential Club. The $30.7 million project will create use 111,000 square feet for 109 residences and common areas in the historic 338,000 square foot Building 50, which already hosts restaurants, shops, galleries and residences. Club Executive Director Linda Price (cq) and Club General Manager Nate Glidden (cq) were introduced at the event. Construction of the facility, which will include a health and wellness spa, theater, pub and art studios, is expected to be completed in fall 2014.